One businessman carries more than his fare share of the load in this humorous concept stock photo dealing with management problems, administrative issues and fairness in the work place. Not too long ago I blogged about feeling overworked. I illustrated the blog with a stock photo of a man’s head exploding. I was mulling that image over in my mind, thinking about whether it would behoove me to create another version. My thoughts morphed from the concept of having too much information, to having too much to do, to carrying to large a load to carrying more than one’s share of the work. Certainly a lot of us, I would guess all of us at some point or another, feel like we have to carry too much of that load. Too much weight, too much responsibility, too much everything! And if all of us feel that way, there must be companies that have products and services that help us deal with those situations. Those companies need to advertise their services and products. So how can we create images that will work for them? I came up with the idea of a businessman with his fellow workers all piled onto his back. It is an image that I haven’t seen before, is visually interesting, and when accompanied by a headline can have a clear and compelling message. It is also tricky enough, and time-consuming enough, that there aren’t going to be a whole lot of people creating the same image. All in all, it sounds like a good stock photo to invest in. Below I will share how i did it with the "before" photos and explanations. OK, how to make it? I could shoot it on white…but I have found it to be the case that images with an environment seem to bring in more revenue than those on white. It seems logical that a business environment would be a good one. I don’t really want to go out and find an office just for this one shot. The solution, for me, is to create the environment. The following is how I created this concept stock photo of carrying too much of the load. The way I work these days is to come up with a series of concept stock images and shoot the models all in one session, then spend the next week or two doing the composite work. I have a small but serviceable studio (1,100 square fee) in Sausalito, Ca. I have a shooting area, an office, and an extra room for whatever. It was in my studio that I shot a few models in enough poses to create roughly a dozen composite images. You can see that I don’t get real picky about backgrounds…sometimes I end up cursing myself for my cavalier attitude! For this image, as you can see, I had my model stand on the floor (he is standing on a discarded piece of white seamless that I was simply too lazy to move) and pretend to hold the models on his back. They were actually seated on apple crates; except for the one woman who actually was sitting on him piggyback style. I then photographed another model seated on a table. This model is George, a neighbor of mine, who filled-in at the last minute when one of my scheduled models simply failed to show (I hate that!). I photographed the models as if they were on the primary models back; in reality they were sitting on apple boxes with the exception of the lone woman model who actually was on the man's back. When one model didn't show, I recruited my neighbor, George, to fill in. In that “whatever” room in my studio I have a cubicle set up which I sometimes use for a kind of business set. 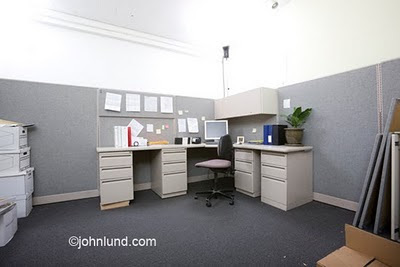 The corner office area was still “dressed” from a previous shoot, and in fact, even my strobes were still in place. This is actually a pretty small room. I pressed myself against one wall and with a 16mm lens fired off a few frames. My idea was to do a quick test to see if the cubicle set would work for this image. I didn’t bother moving the storage boxes on the left, which are actually full of transparencies that I don’t know what to do with. On the right are some extra cubicle parts piled in the corner. I have this "set" of a cubicle in a spare room at my studio. This was supposed to be a "test" shot so I didn't bother cleaning it up! I pulled this shot of tango dancers in an office, shot in Buenos Aires, to use for my "background" behind the office cubicle. I used the pen tool in Photoshop to create a clipping path around the cubicle walls and foreground, and, after converting the path to a selection with a 1-pixel feather; I did the old “Command-J” to create a new layer. This way I could pick a background and paste it behind the cubicle to provide some sort of larger office environment. After trying a few things out I came across this shot of tango dancers in an office setting. I had shot this a couple of years back in Buenos Aires. I pasted it behind the cubicle, and then made two separate files out of it, one for the right hand wall and one for the left hand wall. I next used the Transform>Distort function to give the walls similar angles to those of the cubicle walls. Next I used the pen tool to create a clipping path around the models. I left extra room around their hair. Again I converted the path to a selection and created a new layer out of the selection. I used the extract filter to eliminate the unwanted areas around the hair. I pasted the group of models into the image of the set, and then pasted George in. I used the liquefy filter to adjust his legs a bit so that he fit in as if he had been also seated on my standing model. I used a combination of adjustment layers (Brightness/Contrast), and airbrush layers (painting black with the airbrush) to light and darken appropriate areas and to add shadows. There was a fair amount of cloning and so forth to clean up the right hand corner of the room, eliminate various imperfections, shoe logos, and debris on the rug. I never did re-shoot the room, just got caught up fixing up the shot I had…oh well! I also had to get rid of some color fringing which I had neglected to do in RAW. I used an airbrush set to “Color” with the opacity set to 50% to accomplish that task. Once complete I have an image that can be cropped vertically for a magazine cover, horizontally for a spread or billboard, or anything in between. There is plenty of room for headlines and body copy. I left the storage boxes in, figuring they lend an air of authenticity to the situation…and can also indicate moving or such; or the end user can easily crop out the boxes. A Half day, No a Whole Day! Total imaging time came in at around a half-day, though I keep interrupting the process to check on my web traffic, peruse my e-mail, answer the phone and run to a nearby café for a cup of coffee. The end result is that it takes me a day to do an image like this. Excluding my time, this way of working usually ends up costing me an average of around $100 to $150 per image model fees, props, assistants, shoot food, etc.. In an interesting aside, my most expensive shoots have also tended to return me the most money. This image is great for dealing with management issues, administration problems, fairness in the workplace, overworked employees and workplace perceptions. The image addresses ethnic diversity, gender diversity and age diversity. A creative art director or designer can use an image like this in ways we could never even imagine. I believe that creating useful, versatile stock photos with impact is a way of providing excellent service to the clients that we, as stock photographers, seldom ever get to meet. I submitted the completed image to Blend Images and it was accepted into the Royalty Free collection. I thought briefly about arguing for Rights Managed, but then decided that perhaps my art director was right, and that it might even do better in RF than RM. At any rate, as more of my concept images go into RF I should get a more concrete idea of which model actually gives me the best return on my investment. We will see…. Wow I had no idea so much work could go into a photoshoot. This is pretty amazing. It'll make me look at these types of photos with a little more respect. And that was a pretty simple one!